Turns out I was too hasty in condemning the queue at Angelina. This time however, and exhausted from the Louvre and the Mont Blanc debacle, the queue is scheduled. The third suggestion from Andrew was Chartier, but he warned me of likelihood of wait since they don’t take reservations. It closes at 10 so I thought I better go straight there, even though it is only an hour since the end of Mont Blanc #2. Sure enough there were at least 30 people waiting. However, there was a table waiting for a solitary friendless soul so I jumped past all the couples, threes, and fours. I plumped for endive salad with Roquefort, choucroute alsacienne, and some pommes frites coz they looked nice. Steered clear of tete de veau and andouillette for reasons which regular readers will understand. Order is now duly written on my tablecloth. The room is cavernous and the sound of conversation echoing. I hope they take a long time to bring my food. I am sure they won’t. 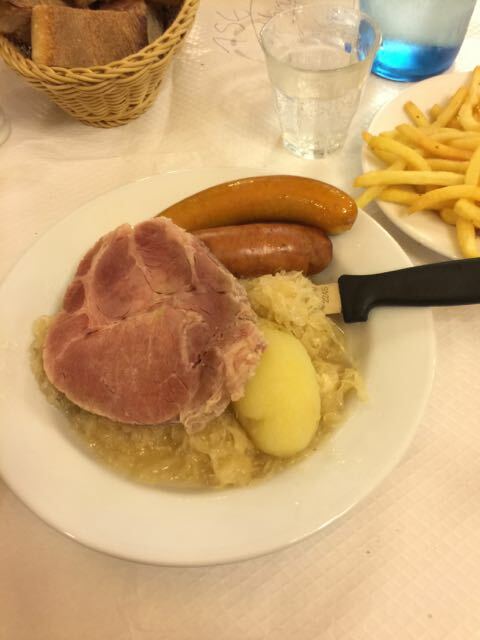 So, judging from what appears only, since I have never made it myself, choucroute alsacienne is finely shredded pickled cabbage boiled with ham and assorted charcuterie and served together with the odd boiled potato lurking therein. If you want to try it in London I highly recommend the Delauney. At Chartier it was also lovely although – as with the whole restaurant- rather more basic. I attach the now mandatory pic above. It was also quite the best value meal I have had so far. My starter of endive salad had so much Roquefort on it I can’t imagine how they can buy it, let alone sell it, for the few euros that it cost. The frites were probably ill-advised but delicious so I was replete after only the two courses.